Quebec MP Maxime Bernier says he didn't tell anyone from the Conservative Party that he planned to bolt before making his stunning political announcement yesterday in Ottawa. Maxime Bernier says he didn't tell anyone from the Conservative Party that he planned to bolt before making his stunning political departure yesterday in Ottawa. The Quebec MP said he didn't see the need to tell any of his caucus colleagues of his plans to start a new party because he had received a clear message from Conservative Leader Andrew Scheer that his ideas weren't welcome in the caucus room. In an interview with​ Vassy Kapelos, host of CBC's Power & Politics, Bernier said he began putting things in motion after speaking with Scheer 10 days ago as questions mounted around his views on a "cult of diversity." Soon after their phone call, Scheer put out a statement saying Bernier doesn't speak for the party. Bernier said he then "decided to go on and work on the press conference, and to do the announcement like I did." Bernier, who represents the riding of Beauce, announced his departure from the party on Thursday as the Conservatives' policy convention kicked off in Halifax. Former Conservative cabinet minister Peter MacKay, who helped build the modern-day Conservative Party after the merger of his Progressive Conservative Party with Stephen Harper's Canadian Alliance, called Bernier's departure "unfortunate." "What I've heard was this blindsided a lot of people," MacKay said. "But many saw it coming." When asked if he thinks he could be prime minister, Bernier said, "I hope so." "When you look in France, President Macron was a socialist. A year before the election, he decided to quit the party and formed his own party and now he's the president of France. So everything is possible with ideas." The key difference is that in French presidential elections, the electorate votes directly for the person they want to be leader. If Bernier wants to form the government in Canada, he would have to run candidates in as many of the country's 338 ridings as possible. "I won't have any support from the caucus; I didn't have any support from the caucus during the leadership," he said. "The leadership and the caucus, they don't want to have the kind of discussions I want to have." 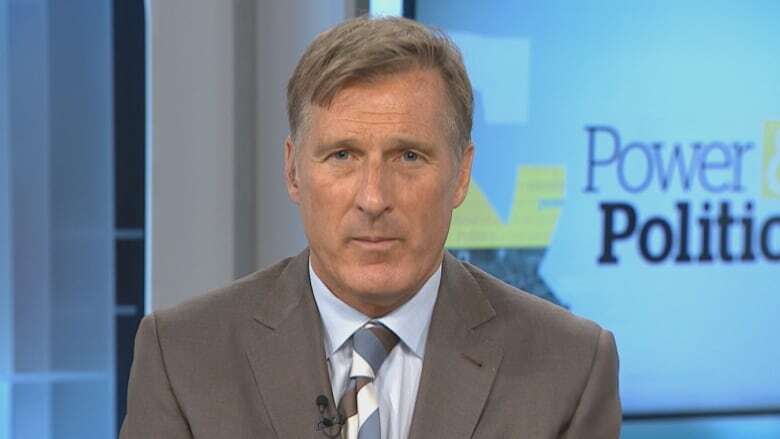 Vassy Kapelos's interview with Maxime Bernier airs today on Power & Politics beginning 5 p.m. ET on CBC News Network.